There’s nowhere quite as lonely on the football field as when you realise you’re defending 2 vs 1. When you’re the only defender standing in the way of a stampede of attackers, that can be a bit disconcerting. Let’s be honest, in 2 v 1 situations the odds are not on your side. But that’s no reason to admit defeat. There are still ways to play this situation which will minimise the opponent’s chances of scoring and maximise your own chances of being a hero. 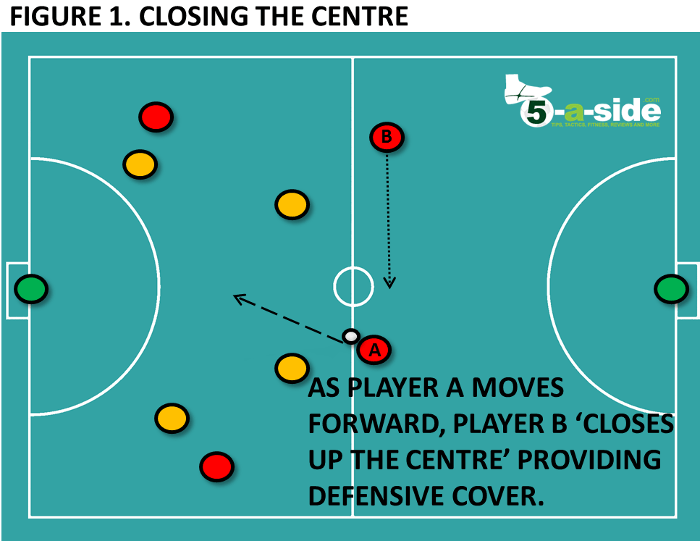 2 v 1 situations generally arise on the break, when your team has committed players forward and the ball has been lost, leaving a solitary player at the back to hold the fort. Your job is to delay and, if possible, break-up the onslaught of attacking play to save your team from conceding a goal. 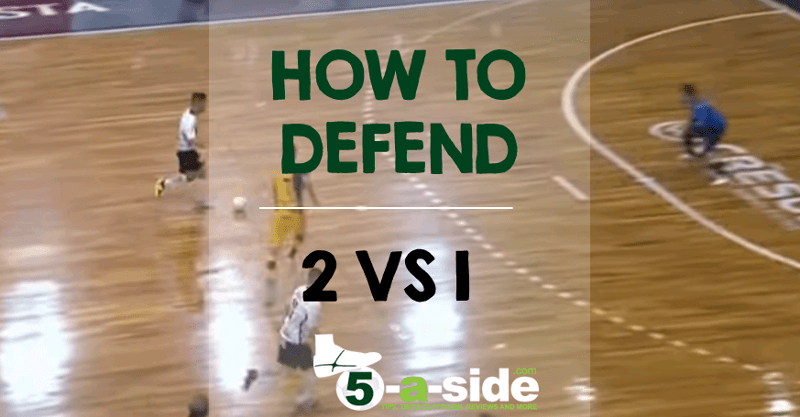 If you are the covering player, the last defender, then you can ensure you position yourself correctly before the 2 v 1 even arises. This means positioning yourself centrally – which you might hear referred to as ‘closing up the centre’. In the diagram above, the moment that player A steps forward with the ball, player B is out of the action. Moving towards the middle, is a much better move, in case the attack breaks down and he faces the counter attack. Being in this position will often allow you to sweep up the ball before the opponents even get a chance to latch on to it. But even if the ball breaks to the opponent, your presence in the centre will ensure that they don’t have a clear and easy route to goal. So if you find yourself not positioned centrally when the break is on, then unless it’s obvious that you should press your nearest player immediately, it’s important that you recover the centre ground as quickly as possible. The quicker you can get back in, the harder it’s going to be for the opponent. There are an infinite number of possibilities when it comes to how the two attacking player can combine together to try and outfox you. No two situations will be exactly the same. The trick to defending is to be able to adapt as the play unfolds. To best do this, you need to be on your toes and ready to pounce on any opportunity that arises. Being on your heels, or ‘flat footed’, isn’t going to help you react quickly. In addition, you should keep your body shape open so that you can see both players at the same time. It’s important that you don’t turn fully towards one of the players otherwise you won’t be able to see the other attacker – and turning will take you that much longer. Prescious split-seconds that can be the difference between success and failure. Sure, he does look to be destroying two members of the youth academy, but there’s a lot to learn from his technique and aggression. The ‘passing lane’ is the term we use to describe a line between the two attackers which the ball will need to travel along for a pass. To defend effectively you should position yourself so that you put pressure on that passing lane, causing the attacker with the ball to think twice about whether they should make the pass or whether to run with the ball instead. This decision might only cost them a second or two, but that’s valuable time allowing your teammates to recover. To press the passing lane, you don’t want to be standing right in it, or you’re likely to be too far up the pitch leaving too much space for the player with the ball to run into. 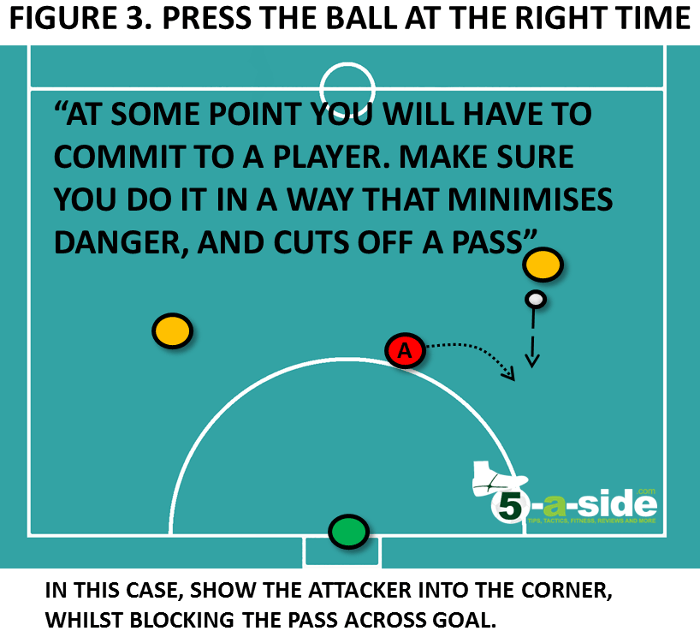 The trick is to defend the goal, whilst also pressuring the passing lane. By doing this effectively you sometimes find that you’ll be able to intercept a poor pass. Often though, you will be able to hold up the attack long enough for one of your teammates to come back and join you in defence making it a 2 v 2 scenario. That’s assuming that your teammates are actually going to track back. At some point you will find yourself having to fully commit and pressing one of the two players. If you are able to influence which of the two players take the shot, it’s more effective if you can force a player onto their weaker foot. For instance a right footed player is likely to take a much worse shot from a wide angle on their left foot. So if you can put him in that position, that can be one way of minimising the danger. Not many players are truly two-footed. It may also be worth isolating the weaker of the two players if one is clearly better than the other. However, when you are pressing any player make sure that you are also covering the possibility of them passing to the other striker. This is important because if you have gone in fully on the player with the ball then the other opponent will be in loads of space. If the ball arrives at the supporting player’s feet, they will have a lot more time and possibilities with which to score. 5) If you get the chance to win the ball, take it! In defending a 2 v 1 scenario the odds are stacked against you so in certain instances it is worth taking a risk for the possibility of winning the ball. If a player has taken a touch which is loose and the ball has bounced temporarily outside of their control, that could be a good time to step in and try to win it. Equally, if an opponent has committed to running down the line, it could be worth pressing the player tightly, forcing them into a corner where they can’t do any harm. Remember though, you must do this decisively and aggressively (though fairly) as once you are drawn out to either player you are likely to have surrendered the central area and the other player will be left alone. 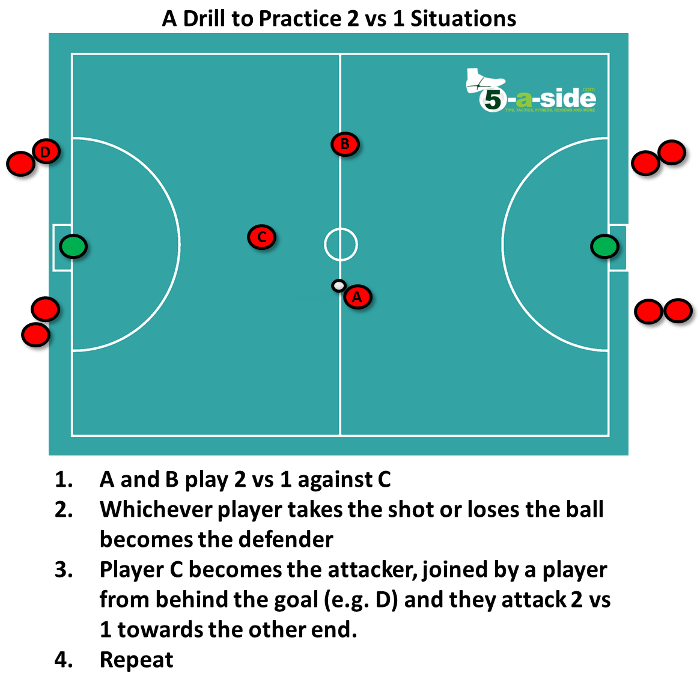 The following drill is fast-paced and allows continuous 2 vs 1 practice. It’s intense, so you might not want to do it on a full court (you could play on a shortened court), and you should take a break every couple of minutes. The football I play is usually anything between 5-7 a side. Do you think with those large sides you should still only have 1 last defender? If you should have more than 1, where should they position themselves? Also, for point 1 you emphasize the last defender should place themselves centrally, but what about if the opposite sides last man is out on the wing? Hi Benjamin, I’d say that in formats from 5-a-side to 7-a-side you still get 2 on 1 situations. The more the players, the fewer the number of 2 on 1s, in my experience. The number of 2 on 1s also depends on the style of play. If the opposition are sitting very deep, for example, you might not get very many counter attacks. If the opposition’s most advanced player is out on the wing then I’d still stay relatively central, but in a position that I could still put some pressure on the pass out to that player. But it also depends how much support that player has with them on the other side of the pitch. If they’re well supported then you may not want to fully commit to either wing. When we were getting coached by Ernest cardona he used to say to us in 2v1 you have to trust your keeper to close the space so if you commit to one side the keeper needs to bare down on the other player and the ball and make the goal tiny. You see it in Futsal a lot. Hi Darryl, I’ve heard a bit about Ernest. Sounds like a good coach. I do agree with that at some point you’re going to have to make a decision and if the other guy gets it, it’s all on the keeper. But as the outfield player, you lead the choices about which player to isolate and when to do it, making the keeper’s job a lot easier / harder, depending on how you do.